Everything on sale at Madewell is an additional 40% off right now, and much of it is both rather cute and under $100. Reader request: Whither Dr. Scholl’s exercise sandals? Leslie had no cause for concern. Dr. Scholl’s Exercise Sandals still very much exist, although most of the newer models aren’t going to please purists: the soles are darker and look synthetic, its classic lines have been messed with, and the sole has a rubbery middle layer. All of this combines rather unfortunately to make them look like Dr. Scholl’s knockoffs instead of the real thing. For those, you’ll need to turn to our old friends at the Vermont Country Store where they’ve them in all their jolie laide glory, in blue, beige, and white, just like you remember them. The ad is from a vintage issue of Seventeen, and I’m trying to figure out precisely how vintage: what do you say, guys? 78? 79? Possibly early, early 80s? That short denim skirt is throwing me off, but the parted-down-the-center-feathered hair of the guy to the left is pure 1978. 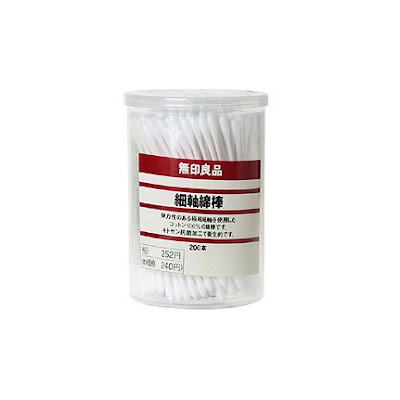 My Muji cotton swabs make me feel so damn cosmopolitan.